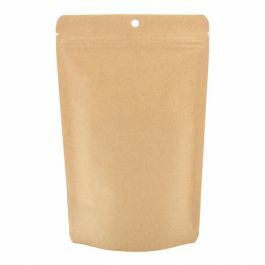 Reduce your impact on the environment with this eco-friendly Kraft Stand Up Pouch. 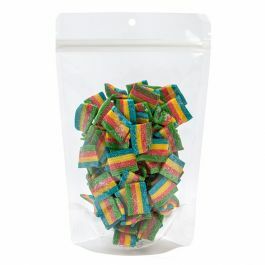 The SUPEK3 pouch measures 5 1/8" x 3 1/8" x 8 1/8" and holds 4 oz/113 g. Package snacks, candy, mixes, nuts, and more. 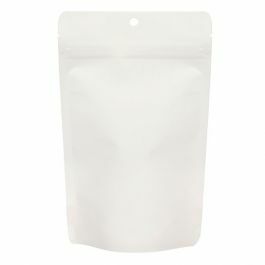 This pouch has a high moisture and oxygen barrier to keep products fresh. The pouch is open-ended (with no zipper) for easy filling. 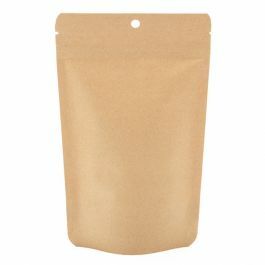 The 5 mil pouch is made of 65 gsm kraft paper and has tear notches and a round hang hole for retail. The inner lining is derived from plant-based material (PLA) and includes a clear ALOX coating, allowing this package to have high barrier properties and made from 100% compostable materials. Enhance your brand with a customized print. See our custom page for more details.